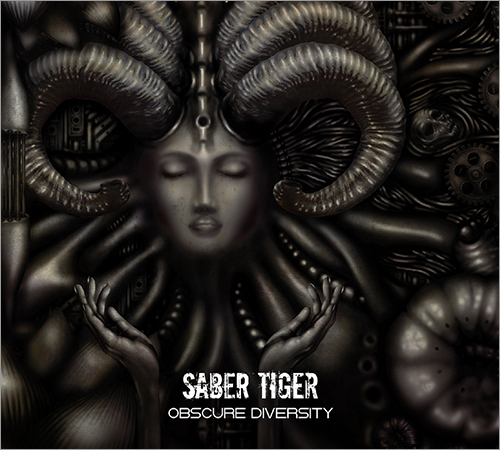 It is difficult for me to be objective about the new Saber Tiger album, having made a minor contribution to its production, but the fact is that ‘Obscure Diversity’ would have excited me regardless. Saber Tiger won me over with their intense combination of traditional heavy metal and contemporary progressive touches a long time ago. ‘Obscure Diversity’ miraculously manages to explore the possibilities of that trademark style more extensively than anything the band released since ‘Timystery’ whilst simultaneously sounding more streamlined than their previous efforts. This makes ‘Obscure Diversity’ an extremely pleasant listen that reveals several secrets over multiple spins. Once the surprisingly theatrical intro ‘Daguerrotype Of Phineas Gage’ is over, ‘The Crowbar Case’ seems to suggest we are getting a more aggressive take on Saber Tiger’s sound here. The opening riff is thrashy, almost Bay Area-styled in character. When this type of riffing mixes with the band’s tried and tested sense of melody and drama later on, a winning combination is found. This type of high velocity meets supreme sense of melody metal can also be found in the pulsating ‘Permanent Rage’, the dense, stomping and climactic ‘Beat Of The War Drums’ and to a lesser extent the album’s first video ‘The Worst Enemy’. Uptempo aggression is hardly the only thing the band goes for on ‘Obscure Diversity’, however. After all, its title delivers a promise to live up to. In that respect, the first contribution bassist hibiki made to the Saber Tiger canon is a real winner. ‘Distant Signals’ takes all the melodic and especially progressive influences people may expect from his history with Light Bringer and combines them with all of Saber Tiger’s trademark aspects to create a gorgeous dynamic metal track that truly allows singer Takenori Shimoyama to shine. ‘Distant Signals’ is a unique track, but it makes complete sense within the context of ‘Obscure Diversity’. Dynamics are also key in ‘The Shade Of Holy Light’ and ‘The Forever Throne’. Technically, both of these tracks would qualify as semi-ballads, but they are much darker and more atmospheric than one would usually predict from that description. This approach provides all the room that guitarists Akihito Kinoshita and Yasuharu Tanaka need to play at their most passionate. Their spectacular guitar work is a main attraction of Saber Tiger anyway. ‘Stain’, for instance, is full of incredible lead guitar work even outside of the solos. Their trade-offs are incredible. The solo spots for hibiki are relatively limited in number, but when he does get them, it does not take long to realize he is one of the best bass players in Japan. More than 35 years in the music business does not appear to be slowing down Saber Tiger. In fact, this decade has arguably been the most consistent of their career. Relative youngsters hibiki and Yasuhiro Mizuno form an incredible rhythm section that is both intense and complex, upon which Tanaka and Kinoshita can build their timeless riffs. Shimoyama is also as passionate as ever. But how can he not be with such an incredible set of songs to work with? ‘Obscure Diversity’ is a no-brainer for anyone who enjoyed Saber Tiger’s last few releases, but the more adventurous fans of the likes of Nevermore and Iced Earth should certainly give this a chance as well.